EFF leader Julius Malema took centre stage in Parliament by refusing to withdraw a statement accusing the ANC of the murder of Marikana miners. THE Economic Freedom Fighters have already made their mark in dramatic style after successfully gaining 23 seats in Parliament courtesy of more than one million voters who ticked the box next to their party during the elections. 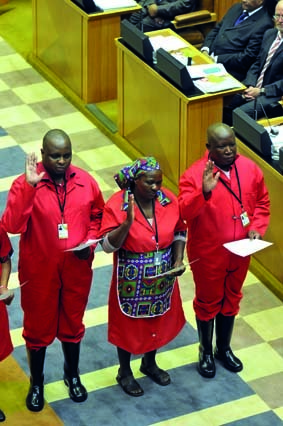 The male leaders of the EFF along with their president, Julius Malema, were sworn into Parliament clad in their symbolic red overalls, which mimic the uniforms of mine workers and gardeners while the women wore maid’s uniforms. This was meant to be a political statement that showed the EFF was there to represent ordinary, marginalised South Africns. It also sent out a warning that South Africans could expect more controversy from the EFF in the next five years.